This Christmas I’m asking for one thing: A pet gate. We’ll have carpeted stairs in our new home, and while I know CG will master them without too much trouble, Ellie may take a while longer to build enough strength and skill to manage them easily. That said, I wanted to make sure that she’ll be safe all of the time. Certainly, we’ll allow her to try the stairs when we’re supervising, but at this point – knowing that she has nearly no experience with stairs – there’s only one way to make sure that she won’t try them / investigate / accidentally tumble-down them while we’re running errands / sleeping / looking the other way: A pet gate. The gate cannot be climbed: This request eliminated any gates with a honeycomb, checkered or criss-cross pattern, and left those with vertical bars. Side note: The width between bars is also important, as you don’t want anyone squeezing through them! The gate must lock in place securely: Growing up I remember having pet gates that would fall over if you accidentally bumped into them. 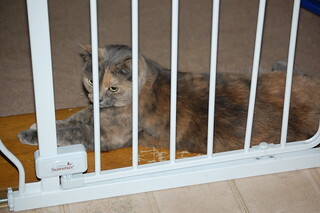 Considering Ellie is an 8-pound tumbleweed, I wanted to make sure that no matter what, this gate will stay in place. The gate must be moved easily: We would need to move the gate from two important locations: First, the base of the stairs when the cats are confined to our main floor, second, it would need to be moved to the top of the stairs at night, when they’re sleeping upstairs. Preferably, the gate would have a door (for humans): This is definitely a want, not a need, but I really didn’t want to have to climb over a gate – ever. Especially while trying to go down stairs. The gate’s door swings one way: As I was looking into pet gates, I realized that gates specifically designed for the top of stairs are built so that they only swing one way. So if you’re at the top of the stairs looking down, the gate only swings toward you. This safety feature ensures that no one will accidentally open the gate and tumble down the stairs. After doing an evening’s worth of research, I became overwhelmed with all of the different types of pet gates out there. But, I was able to rather easily dismiss some if they didn’t meet our needs above. Reading reviews also helped a great deal, as they sometimes provided more information than the product’s specifications. In the end, I think we found a reasonable option. It doesn’t meet all of the needs, but I think it will do. For example, the gate’s door swings both ways, but it comes with a safety lock on the handle (at the top of the gate) that can lock the gate door in place. So we’ll see! I’ll keep you updated with how it goes once we receive it and use it in our new home! Have you purchased a pet gate? Which features were important for you to have? ← Why Do Cats Need Their Claws? So which one did you decide on? We, too, are looking for the perfect gate for our stairs to protect our CH Kitty, Triton. We decided to go with this model and brand: http://amzn.to/R9dFnt; however, as it’s a present, we haven’t received it/tried it yet, so I’m not sure how well it works yet. If you’re looking for a gate, too, I’d recommend doing some searching online. There are so many different varieties that you’re sure to find one that will work for you. Good luck! We bought the “Richell Wood One-Touch Pet Gate, Autumn Matte Finish” (from Amazon), and it works great! We needed a gate right after we brought our CH kitty, Alex, home this past July. Since he was still really small, only 3lbs, we needed one that had very little space between the vertical bars so that he couldn’t walk right through them – and we didn’t want one with horizontal bars because he was already a good climber. The Richell gate, while a little expensive, fit the bill with only about 2” between vertical bars, is very well made, and is good-looking (for a gate at least). We’ve had to travel with Alex multiple times since he joined our family, and the pressure-mounted gate is really easy to take down and set up in the doorways of his ‘grandparent’s’ house to keep him safely sequestered in the guest bedroom.